Razer has unleashed a version of its Raiju controllers for smartphones. It is ostensibly designed to compete with similar products made by Xiaomi and Asus, although it may fit devices besides the company's own gaming-focused smartphones. The 'mobile' Raiju features the Mecha-Tactile action buttons found on the Ultimate variant of this controller. Razer has released a new variant of its Raiju controller. This one is designed for mobile devices, and may be a response to other products, such as the range of separate-purchase accessories for the ASUS ROG Phone. Like the Raiju Ultimate for PlayStation, this mobile version has 4 Mecha-Tactile action buttons (i.e. in place of the square-triangle-X-circle buttons). The new Raiju Mobile has the Tournament layout, in which the left-hand thumb-stick and arrow buttons are inverted. This controller also has a hair-trigger mode for rapid fire, as well as trigger stops for quick fire. It also (obviously) has a phone mount with as much as 60 degrees in tilting ability, although it is not clear if it can fit non-Razer phones. The new Raiju can connect via Bluetooth or USB-C, although it may require a USB connection for power. Its built-in battery is rated for up to 23 hours of use on one charge. 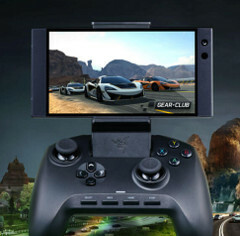 A potential customer would need to be serious about their mobile gaming, however, as the Raiju Mobile is priced at US$149.99 on Razer's website. It should be noted that it is only compatible with Android, and requires Android 6.0 (Marshmallow) or higher for compatibility with its software and interface.